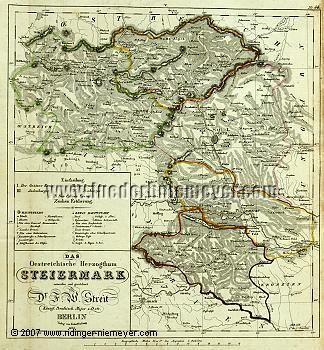 Styria, The Austrian Duchy. With simple double cartouche for title, territorial division + signs and symbols as well as with miles indicator. Detail map by Frdr. Wilhelm Streit (Ronneburg, Thuringia, 1772 – Berlin 1839) in steel engraving colored in outline. 1835. 10¾ × 9⅞ in (27.2 × 25.1 cm). With country + artificial roads with and without express posts, postal stations, navigabilities + bridges , high schools , passes , glassworks etc. – Right in the center “Graetz” , still with Laibach . – Nondisturbing vertical fold in the left map margin. In the margin partly weakly foxing.